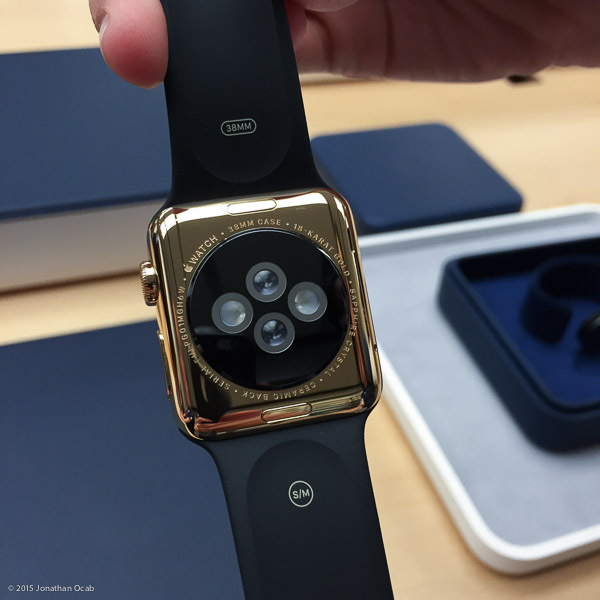 Last Saturday I went to the Apple Store in South Coast Plaza to view the Apple Watch. I specifically went out to Costa Mesa since it was one of a few locations to have the Apple Watch Edition models. I had made an appointment, since it appeared that appointments were necessary to get a hands on viewing of the Apple Watch. But it appears that they were accepting some walk-ins, since the Apple employees (from what I observed) were asking random people near the Apple Watch displays if the wanted to see one up close. During my appointment, I was bounced between two different representatives, one who showed me the Apple Watch, while another handled the Apple Watch Edition viewing. It was interesting that they didn’t want anything on the table or mats when I was viewing the watches. I had set my watch down when I first viewed the Milanese version, and the representative wanted me to move my own watch off to the side (off the mat). When I viewed the Apple Watch Edition, the representative asked if I could keep my watch on my other wrist. I’m not entirely sure why this formality took place. Perhaps a security measure so representatives and in-store security (personnel and cameras) have better line of sight and awareness of the product. It could be also just to keep a strict, clean environment in which the viewing takes place. Another thing is that the Apple Watch units brought our were actually non-functional. They were simply on a non-interactive demo loop. They had interactive models secured to the tables, but the watches being brought out for people to try on were not truly working. It appears that the goal for the Apple Watch one-on-one appointments was more for question and answer and helping customers find the fit and style they wanted. One of the first things I wanted to see was the difference between 38mm and 42mm. Frankly, I found 42mm to look too bulky. 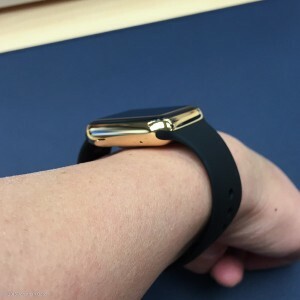 Even though I wear a 43mm Blancpain Fifty Fathoms without any real issue, the Apple Watch 42mm just doesn’t look all that appealing on my 7″ wrist. The 38mm seems to be the better all around fit. I think most people are going to go for the 42mm, since bigger watches are the modern trend. I feel that Apple would have been better off going with a single 40mm option, which is the best ‘universal’ size in modern watch world. Not too big, not too small (hint: Rolex). I also wanted to see the milanese bracelet in person. During the Apple livestream, the Apple Watch milanese bracelet looked quite impressive, and after seeing it in person, I can attest that it is well executed. The mesh looks clean and the magnetic ‘buckle’ is quite secure. 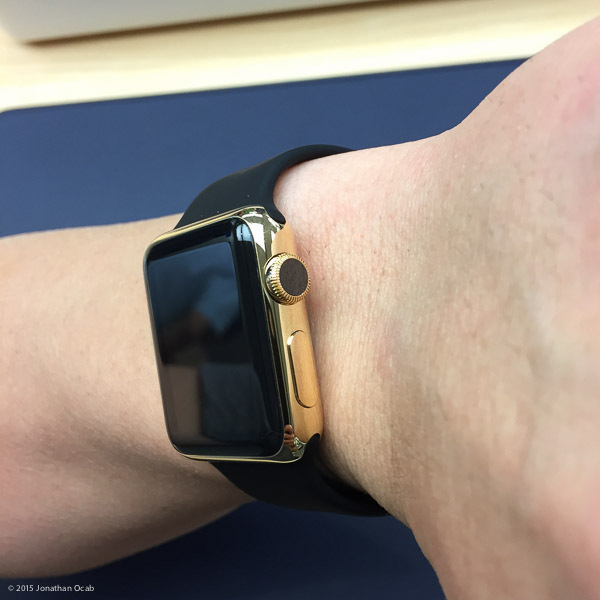 If you tug on the bracelet while the watch is on, the buckle doesn’t slip without deliberate tension or force. 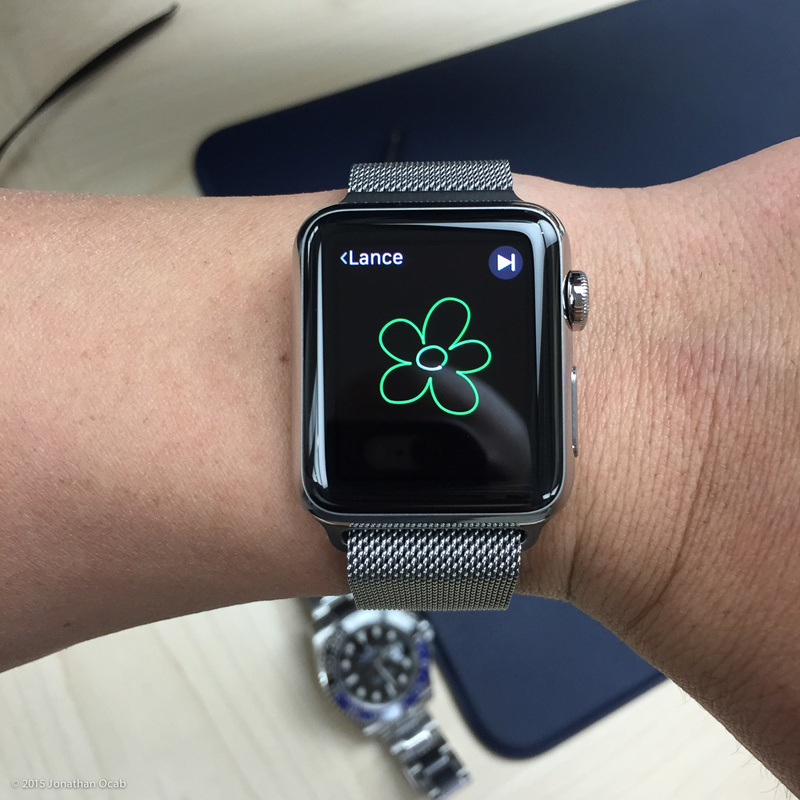 I think the milanese is the best Apple Watch version for all-purpose, non-sport use. One of the few questions I did have revolved around the use of the Apple Watch while out of range from the iPhone. It appears that fitness features will function without needing to be near your iPhone, and will update the iPhone once back in range. Also, I was enlightened of the fact that the Apple Watch can store up to 2GB of music, which is essentially an iPod Shuffle. From a fitness standpoint, this does intrigue me since I use an iPod Shuffle at the gym, and keep my iPhone in a locker. As far as the Apple Watch Edition, the representative was really promoting the luxury, exclusivity, and status of the Edition. She indicated that there was higher level of support with the Edition, with priority on support calls and visits to the Apple Store for support with the watch. She described it as a concierge service and it sounded like it was specific to Edition owners. When I was discussing the sizes of the Apple Watch with the Edition representative, she intimated that regardless of 38mm or 42mm, the fact that you have the gold model will be seen by other people. So it would seem that Apple really wants to push the Edition as a high end luxury item. 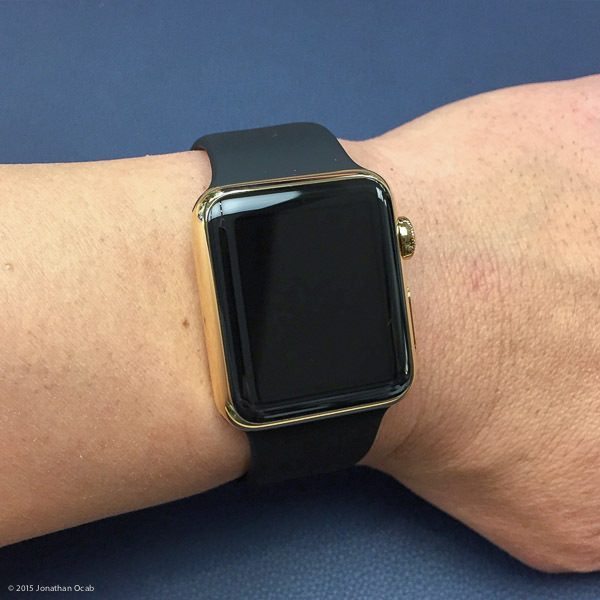 I will say that while it looks clean, the Apple Watch Edition just doesn’t look and feel like a $10,000 watch. I’ve handled a lot of watches in the ‘luxury’ price ranges from $5K to the six figure range. When handling even a $5K-6K mechanical watch, I can feel and see the craftsmanship put into the watch. It all seems so tangible. But with the Apple Watch Edition, I just don’t get that same feel. Other than the fact that the Apple Watch Edition is in 18K gold, when I look at the Apple Watch case and the Apple Watch Edition case, they both look equally refined with the same level of craftsmanship. Yes, one could argue that the level of craftsmanship between a $5K OMEGA is just as good as a $10K Rolex, but there are lots of mechanical and design differences between such mechanical watches in varying price ranges that have nothing to do with the type of metal used to make the watch case. 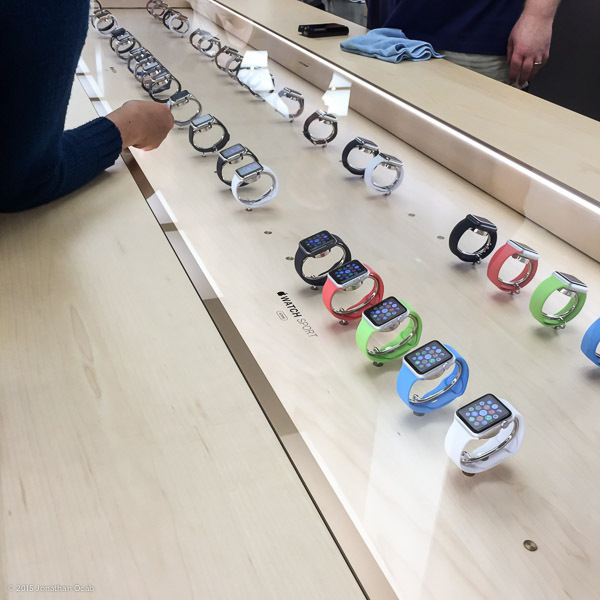 All that said, where do I stand on buying an Apple Watch? I still don’t see myself getting any Apple Watch variation at this time. While I really do like the milanese version, and would choose that one as my one Apple Watch for everyday use, the Sport model would actually serve me better. Since I would still wear my mechanicals for every day use, I could ditch my iPod Shuffle and just use the Apple Watch Sport for music while taking advantage of the fitness features. But then, that’s $400 for the watch, plus another $150 or so to get some bluetooth headphones. I just don’t feel like spending $600 just gym use. There is the option of double-wristing. While I did ponder the idea, it just seems a bit excessive just to integrate a smart watch into my life. The Apple representative had asked me what I liked most about the Apple Watch, and my reply was, “I don’t know. I need to actually use the watch in real life to make any judgement on how it fits my life.” This is essentially true and it leads to a Catch-22. I have to pick a watch to fit my life without knowing how it will fit my life. I think that lots of people who pre-ordered one are in the same boat and are essentially taking a risk on this watch. I anticipate there will be a good number of regretted purchases after the first couple months of ownership, with people either selling one version to get another, or watches slowly being relegated to collecting dust in a drawer. For more info on the Apple Watch Edition benefits, checkout the Apple Watch Edition article on A Blog To Watch. Lots of details I didn’t obtain during my own appointment.